Kirkpatrick’s team from the Swift Current Curling Club — third Jolene Campbell, second Chris Haichert and lead Teejay Haichert — claimed the gold medal at the 2015 Canadian Mixed Curling Championship with a 7-4 win over Jamie Koe of the Northwest Territories. 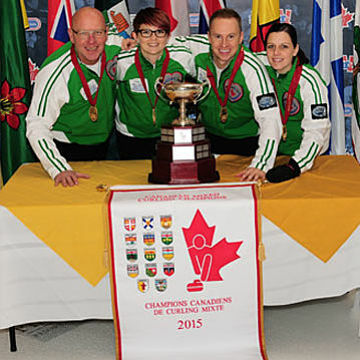 For Saskatchewan, it was its 10th gold medal at the Canadian Mixed, tying with Alberta for tops in the category. Saskatchewan had to withstand some early pressure from Koe’s team from Yellowknife. After Saskatchewan took a 3-1 lead with a third-end deuce, Koe negotiated a narrow port to make a triple takeout and score the tying deuce in the fourth end. But Saskatchewan came back strongly with two more in the fifth, held the Territories to one in the sixth, and put the game away with two in the seventh. With the win, the Swift Current foursome earns the right to wear Canadian colours at the inaugural World Mixed Championship next September at a location to be announced by the World Curling Federation.